Hip Hip Hooray! Manfriend and I are leaving straight after work to head to the beautiful bay area to visit some BFFs and see the sights! One of my best pals and old sorority sisters lives in San Jose with her fiance. Manfriend and I are going to be crashing their love nest for the weekend to do some much-needed catching up and relaxing. 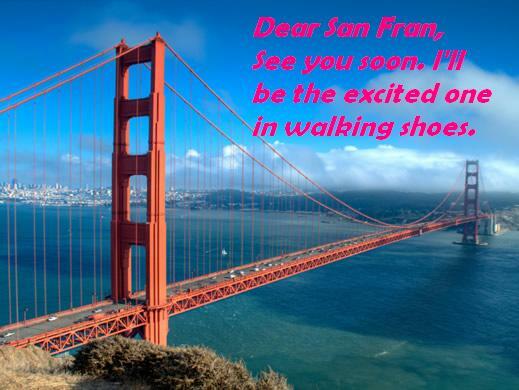 We plan to explore San Francisco, maybe do a little beach time and definitely enjoy some NorCal wine with our buddies. Sorry for being a bad blogger, but I can't. freaking. wait. Talk to you next week, I plan to return with tales of greatness. Or maybe just tales. Toodle-oo! Ooh, have so much fun!